At the beginning of August many of my Pagan friends celebrated the first harvest, commonly known as Lammas or Lughnasadh (from the Celtic calendar system). That observance has never meant much to me. I am not a farmer, and have spent precious little time in places where early August means first fruits of any kind. Now in Washington, it means the height of summer, and I spend my summer time waiting for the days to cool. As August passed I began to have half-formed thoughts of salmon. Had my father said anything about his catch this year? A good catch means smoked salmon. Lo and behold, a box arrived in the mail yesterday. 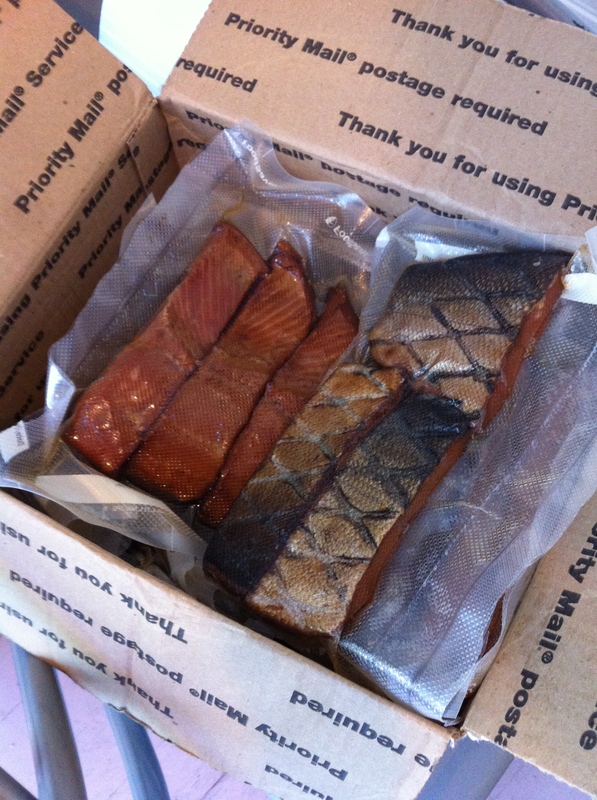 9 pounds of hard smoked, wild-caught Alaskan salmon, that my father caught, cleaned, filleted and smoked himself. I realized this to me is harvest. August is when the best fishing occurs in South East Alaskan waters; this is when the abundance arrives. We’re not yet to the autumnal equinox for the spirit of the season to truly shift for me, but we’re now at the end of summer. In Washington the salmon are running, traveling upstream to spawn. The green chiles and tomatillos, strong bitter greens and garlic are appearing at the farmers’ markets. I stock up on these. I try to make as much salsa verde as possible to store through the winter. Something about tomatillos feels like edible sunshine to me. But Salmon is the Life Giver to me. Growing up my family was a subsistence fishing family. I don’t think I thought of this way until long after I’d moved out of Alaska. Many families fish all summer to fill their freezers. In a land where food costs are exorbitant (everything is shipped in from ‘Outside’), salmon was ‘free.’ I remember sitting at the dinner table thinking ‘UGH. Salmon? AGAIN? !’ Not until I moved away to college did I discover that fresh salmon was a meal of privilege. I imagine that Montana ranchers feel similarly about grass-fed beef. Salmon, halibut, crab – these are gifts of the Alaskan waters. They nourish me, the salmon especially; they connect me to my roots; they remind me that the waters and livelihoods of Washington are intimately connected with those of my homeland. When Celtic legends speak of the Salmon of Wisdom, I understand that deep in my bones. When Northwest Coast peoples tell stories of the sacrifice that salmon make for the people and how important the salmon are to traditional ways of life, I understand that. In a Christian way of thinking, every bite is a Eucharist. So I offer up first fruits to the gods, to the Spirits of this place, and to my family. I thank my father for sending me this annual gift. I thank the Salmon and the Waters. I work toward preserving those waters. I nourish my family with bounty of this Land. We are what we eat, and we are people of Salmon. Hail to the Harvest! Thanks be to the Mighty Salmon! This entry was posted in Uncategorized and tagged Alaska, Christianity, food, gratitude, land, pagan, Place, washington. Bookmark the permalink. Thing about the solstices and equinoxes: The seasons don’t at all ‘seem to shift’ at those times — except in the ‘first day of autumn/winter/etc’ sense — a nominal, rather than experiential, shift. Imagine the Wheel of the Year as a sine wave and you’ll see what I mean. There’s no great difference in the length of day vs night from May 1 to Aug 1, and from Nov 1 to Feb 1. But starting Aug 1 (Lammas) and Feb 1 (Imbolc) the change starts becoming very noticeable. Grasses are the first to reflect the change at Lammas, hence its association with field crops. But the ocean temperatures start to change then too. And that’s what we most notice, harvest-wise, here on the Coast(s).